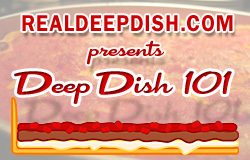 You can start Deep Dish 101 from the beginning by clicking on the image above. on making deep dish dough. I’ve tried to give you the basics so even you can make a ball of deep dish dough in under five minutes. 1) Can I use any kind of oil? You should try to stick to oils that have a higher smoke point, so stay away from the non-refined extra virgin oils (or use them in a smaller amount in combination with another oil). The recipe calls for corn oil and olive oil (the regular kind). I like to skip the olive oil altogether and just use all corn oil. Some people use butter, coconut oil, canola, lard, bacon grease, or crisco. You can use any combination that you like. 2) Do I have to get half of the flour on the countertop while mixing? No, in fact, you probably want to use a little more care than I did when mixing. 3) How hot does the water need to be? which should be about 105 degrees fahrenheit. If the water is too hot, it can kill the yeast. The easiest way to get the right temp water without a thermometer is to put your hand under the water tap while it’s heating up and if the water is too hot for your hand, it is too hot for the yeast. 4) Do I have to use semolina? No, you do not have to use semolina. I list semolina as an optional ingredient for those who like to use it, but I prefer to make my deep dish dough with just all-purpose flour. 5) Is it really that easy to make deep dish dough? 6) Hey, where’s the recipe? I’m going to guess you haven’t read all of the lessons. If you have any questions that the video did not explain, feel free to post a comment and I’ll try to post a reply as soon as I can. Salt kills yeast. Are you sure you want to add the salt at the beginning with the water and yeast? Why not add it later with the flour. This way the luke warm water could activate the yeast without killing off as much with the salt, effecting faster rise time and less yeasty flavor in the crust. Most commercial yeast is resilient enough to survive a little salt contact, Unless you’re burying the yeast in a mound of salt, I wouldn’t worry too much about it. If you’re concerned about it, you can always add it in with the dry ingredients. Adding a little sugar also helps the yeast out. I have also done a trick where I float the oil on top of the yeasty water, then drop the salt into the oil to keep it from directly contacting the yeast. Feel free to make the dough the way that works best for you. 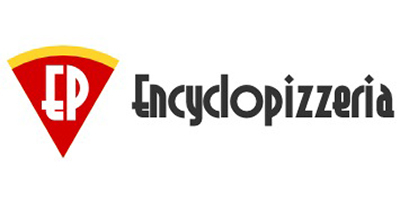 Awesome site! Your recipe is spot on for a Lou’s type pizza! Have a question though….I am a chicago resident and of all the deep dish pizzas, my fave is Carmen’s in Evanston, about 1.5 hour drive that is getting tiresome…the things we do for great pizza. The closest thing I have found to Carmen’s dough is Giordanos….its a more salty flaky crust than Lou’s…seems to be a much different dough. Any thoughts? I’m not familiar with Carmens, but Giordano’s is known for Stuffed Pizza. Deep Dish dough (like Lou Malnati’s) is definitely a different dough. If you’re looking for something closer to Giordano’s or Nancy’s, check out my pre-article on stuffed pizza here: http://www.realdeepdish.com/2015/03-15-yes-darn-you-i-will-get-a-stuffed-pizza-recipe-up-here-eventually/. Once you have a couple thin crust dough balls prepared, try folding and rolling the dough a bunch of times to get the layers, then roll it really thin and drape it gently into the pan without pressing. Great advice, made the thin crust but upped the salt a bit….turned out great! Thanks for the help and all the info! Quick question…do you have measurements for a 15″ deep dish pan? I winged it using the 14″ measurements and added a bit more, and my pizza was sloppy, droppy, soft and wet! Any ideas what could have gone wrong?? You can convert to other sizes using the Dough Tools Calculators at Pizzamaking.com. I don’t have enough information to know why your pizza was wet, but my first guess is that you had too much moisture somewhere, either in your dough, or your cheese (use low moisture, not fresh mozz), or your sauce, or too much fat/grease in other meats, etc. What temperature was your oven? Did you preheat it? How long did you preheat? How long did you bake? I am a Chicago resident, love Lou Malnatis…so I tried your recipe (I am a reasonably experienced pizza maker). Tasted great, but it rose way too much, more like bread than the deep dish Chicago crust we love. Was looking to achieve the results you show in your images. I measured carefully, etc. Any idea what I did wrong? Hi, Jack. Thanks for visiting. There’s a few posts on this site where I’ve gone over most of the troubleshooting issues that people experience, so please take a look around the site for more tips. You mentioned that you measured carefully, but did you follow the rest of the recipe instructions? How long did you let your dough rise? Did you do an additional overnight rise or use it right away? Do you live in a high altitude area, like Colorado? Did you use the correct size pan? If you used one of the smaller dough conversions, it’s possible that you had too much dough in your pan, as the baker’s percentages are more geared toward ingredient weights & the measures are approximate. On your next batch of dough, you try lowering the amounts of water and/or yeast, which should slow the rising. Your recipe is light on the oil–you need 3 Tablespoons oil to 1 cup of flour. You can easily make a deep dish pizza at home far better than Lou Malnati’s! I normally do not allow totally anonymous comments, but since you make a valid (and clearly non-SkyNet) comment, I have changed your name and email to protect the innocent Dragnet re-run aficionados. I reduced the amount of oil because the oil was starting to separate from the dough in the refrigerator. I’ve also found that it’s not really necessary to use that much oil. Use more oil if you like, but I’m happy with my current recipe as a good starting point for anyone trying to make deep dish dough at home. I just tried this recipe but it came out like a thick batter, not a dough. Not sure what the hell I did wrong. I used the recipe for a 9″ pizza. I’d guess that you either measured the flour or the water incorrectly. To recover a dough that has too much water in it, you need to add more flour. If you do that, then you will probably end up with more dough than you need. Save the extra dough in a zip-top bag in the fridge. It should be good for several days. Hi…I tried your recipe and followed your instruction video on the dough making part. For some reason my dough was coming dry and didn’t look anything like yours, I had to add some water. Once it sort of look like yours, I let it sit for an hour and a half and it double in size but when I was spreading in the pan it wasn’t smooth. My husband and I made it anyway and when it was cooked it came out dry and crunchie. Do you have any recommendations on how to get my dough smoother? Deep dish crust is supposed to be more sturdy than a typical pizza crust, so it should be a bit crusty, somewhat like a pie crust, but it sounds like you may not have used enough liquid. Also, if the humidity in your home is dry, you might have to use a little more water in your recipe. The more water you use, the more puffy your dough will be, so don’t add too much. Also, if you have the time, try letting it rise for at least two hours, and if you have more time than that, put it in a zip top bag and into the fridge overnight, then take the bag out and put it on the counter to warm up for at least an hour. Did you coat the dough with a little oil and cover it with plastic while it rises? What kind of ingredients did you use? Did you use all-purpose flour (what brand)? Did you use the semolina option? Did you use the baker’s percentages (by weight) or did you use the approximations (cup/Tbsp, etc.) ? How was your pizza otherwise? Thanks for responding…it is humid in my place so it makes sense. I am going to try the recipe again. I did not coat the dough with oil when it was resting. I did cover it with plastic. I used all the ingredients that you called for in your recipe. I followed the recipe for the 12″ dough. The brand of flour I used was Robin Hood. I am from Canada so we only have that brand or Five Roses and they are both all purpose. I did not use the Semolina option. I used corn oil and olive oil just like you recommended. I followed the approx. measurements. Like I said I am going to try your recipe again. I will take photos and post them on Facebook. The pizza was good but with all this new information I am sure it will be great ;)) thank you again….and Happy New Years !!!! I’ve read and found many recipes that say the secret to deep dish pizza dough is that it is laminated (with butter, like a croissant). What are your thoughts on this? Whoever is saying that is wrong. Deep Dish crust is not that complicated. perpetuated by America’s Test Kitchen and Marc Malnati’s propensity to use adjectives like ‘buttery’ when describing the Lou Malnati’s dough. I will say, I did give that recipe at ATK a try and it was very good. It did remind me of the frozen Lout Malnati’s pizzas I used to spend an insane amount of money to have shipped out to me. (Even cooked it in one of the pans I bought from them). Still, an easier method to making the dough would be much better. 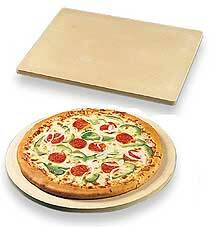 Just went and got a couple 12″ x 2″ deep dish pizza pans from AMCO and will be urging to give your recipe a try. It’s impossible to find any kind of “acceptable” Chicago Deep Dish pizza here in Southern New England, so making it at home is the only option, and frankly, the best. hey, what’s the music in the background of your dough-making video? Thank you so much for this informative website. I just made my first deep dish pizza, following your recipe, and it far exceeded my expectations. I have visited Chicago many times and have always enjoyed The Real Thing, but being a non-chef I assumed making it at home would be far too difficult. Your recipe is so brilliantly simple, almost too good to be true. Thanks again.